This bag conjures up images of the sea. 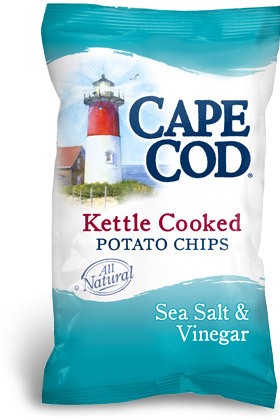 The fresh looking white background, the iconic Cape Cod lighthouse, the deep greyish blue color coding for the flavor. It really is a very good design. The Chip Snap Test was consistent - a few snapped Chips all cracked nicely in the middle. Biting into them was a crunchy delight. As crunchy as most of the best Kettle Cooked Chips. When there is some potato skin on the edges of the Chips it almost confirms the All Natural claim, even if they do include maltodextrin a common food additive and taste enhancer. There are small oolitical vesicles (bubbles) spread evenly over the Chips. They are not as greasy as some, and included a powdery substance spread evenly over the Chips. As soon as you open the bag a heavy vinegar whiff hits you. The taste is consistent and strong. The balance between the different salt powders included with the vinegar powder leans slightly towards vinegar. The acidic vinegary flavor stands out a little but it is far from over-powering.